From Chengdu, we caught a bus to the ancient town of Ping Le. 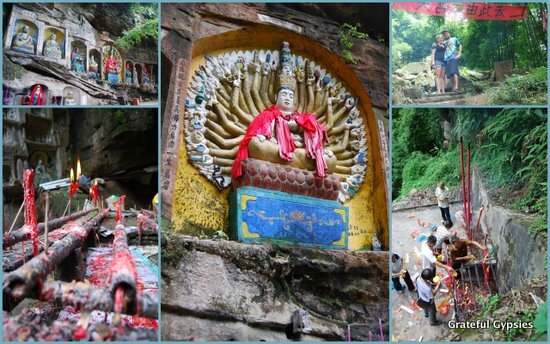 Having heard plenty of horror stories about the crowds and the hawks from other travelers, we chose this old river town over the giant Buddha at Leshan and the crowded Mt. Emei. Home for a few days in Ping Le. Arriving at the bus station, we jumped in a rickshaw and looked for a guesthouse. After a disappointing few stops, we ended up right back where we started, as we found a family guesthouse right across from the station. The owner and her adorable baby son welcomed us in, and we got a cheap room for the night. 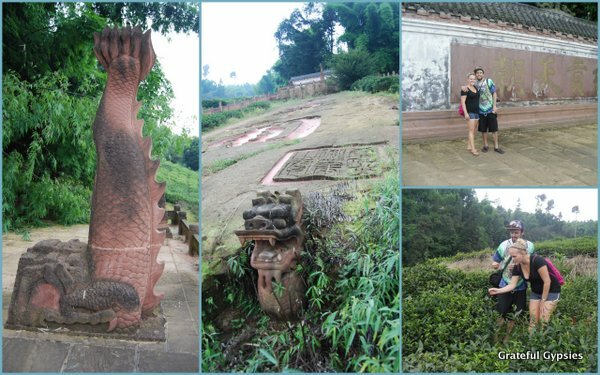 Ping Le was apparently founded way back in 150 BC, and it was once the first town on the Tea-Horse road. Much of the town is not “ancient” at all, however, as you’ll find plenty of brand new buildings and cranes going up in the distance. That being said, it does still retain some of its history and charm, especially with the many riverside tea houses where people like to relax with a cup of tea and listen to the flowing river. 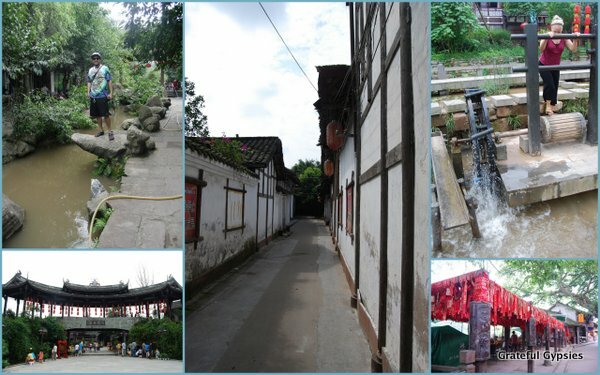 Some scenes of the ancient town of Ping Le. In the evening, we headed down to the river to take in the sights and sounds of this old town. We found crowds of Chinese tourists playing in the river with water guns, wearing cowboy hats, and snapping pics with their iPhones. There was something funny about seeing all of these young Chinese – who had fled the countryside for the big cities – spending their weekend as tourists in a rural town. Along the riverside and all across the town, we saw families burning fires. We’re still not sure why, but we were told it was some sort of religious ceremony. For dinner, we dropped into a local restaurant and ordered up a grilled fish straight from the river. We weren’t expecting to find anything in terms of nightlife, but we strolled around the old cobblestone streets anyway to walk off our big dinner. What do you know, we found what must be the town’s only bar, where we ordered up some White Russians and got in a little karaoke with Chinese students. 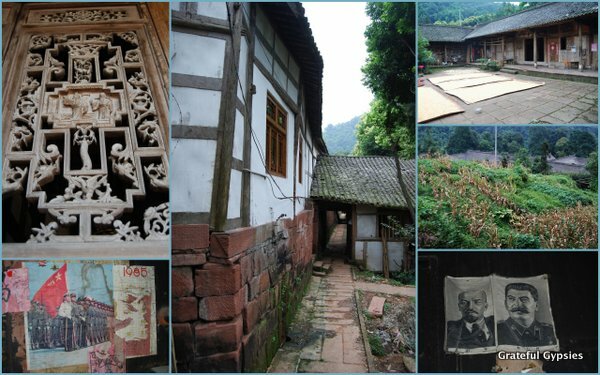 Take a short video tour of Pingle Ancient Town. 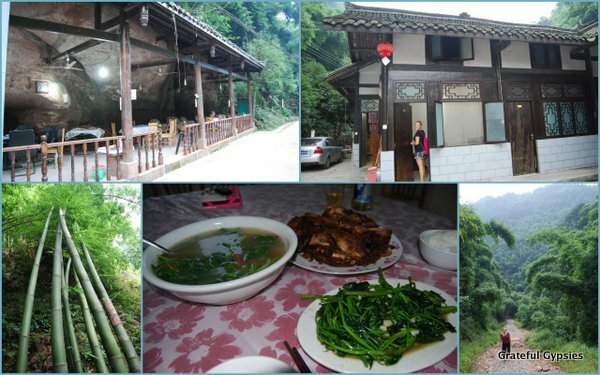 The next day, we hired a driver to take us out to the Jinhua Mountain. 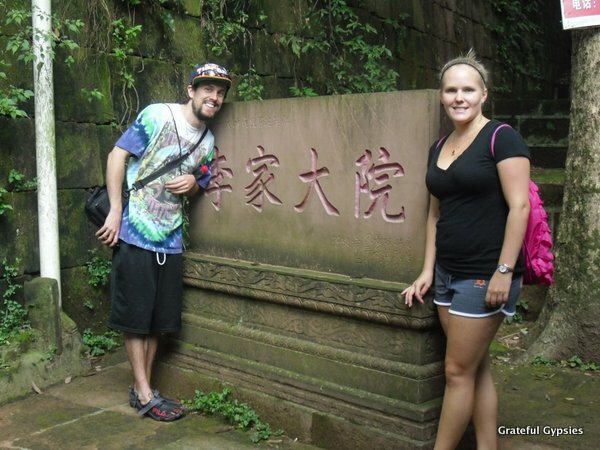 We enjoyed breathing in the fresh air, hiking up the mountain, and admiring the many Buddhist statues. One elderly Chinese woman working there even welcomed us in for a cup of tea, and another led us through a ceremony wishing us a safe and enjoyable trip. There were no hordes of tourists here, no touts selling useless knick-knacks, and there wasn’t even a ticket office. We were happy that we had decided to go there instead of the overcrowded Mt. Emei. The peaceful and beautiful Jinhua Mountain. A great place to spend a few hours – Jinhua Mountain. From there, we visited the Li family courtyard and farm. This Qing Dynasty era family compound is a great place to see a traditional Sichuanese home. While there, we walked around in the tea farm and chatted with a few of the Li family members. They still sustain on farming, and they welcome tourists in free of charge. Of course, you are kind of expected to buy some tea, so we did just that. Li family courtyard outside of Ping Le. Speaking of tea, our driver drove us around through the winding mountain roads, stopping to admire the vast tea fields. We even got to try picking some ourselves. Trying our hand at picking tea. With the sun going down, he drove us to a guesthouse in the bamboo forest, where we got a room for the night. For dinner, the owners cooked up some of the best BBQ ribs I’ve ever had, and that’s saying a lot. Later on, we made friends with the Chinese families who were staying there for the night, and the men of course ordered up a round of beers. Thanks to the booze and their strong Sichuan dialects, their cute little daughters had to act as translators. The girls were cracking us up, telling their fathers things like, “You need to learn how to speak Mandarin, Dad! Even the foreigners speak Chinese better than you!” We had a great time hanging out with them, and it was another reminder of how much we enjoy Chinese people outside of Beijing. Hanging out in the Bamboo Forest. The next morning, we did a little hiking around the bamboo forest before catching a ride back to the town. We walked around the river one last time and got some lunch, and then we caught the bus back to Chengdu. The Li family courtyard and bamboo forest. We went to Sichuan mainly to visit Chengdu and the national parks, and we ended up having a few extra days to spend there. 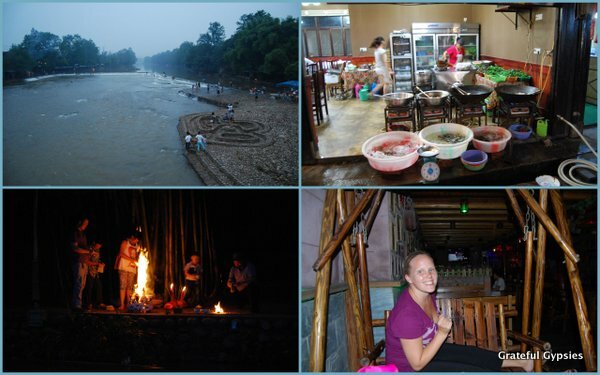 Our choice to spend them in Ping Le was definitely a good one, and we both really enjoyed hiking, relaxing down by the river, and eating and drinking out in the peace and quiet of the bamboo forest. If you’ve got a little extra time when visiting Sichuan, why not head to Ping Le for a few days? We had a nice time staying in Pingle. Transportation: There are a few busses that leave from the Xinnanmen station in Chengdu every day. You can probably just walk up and get tickets, but as this is China, buying them a few hours in advance certainly doesn’t hurt. Get Around: You’ll find rickshaws in the old town, but you really don’t need them. It’s small enough to just walk around, and you can even walk out to the bamboo forest. For getting to Jinhua Mountain or the Li family courtyard, however, you’ll want to hire a taxi. 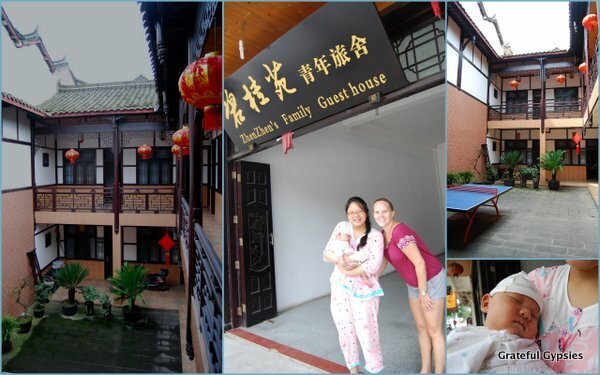 Accommodation: We stayed at the Zhen Zhen Family Guesthouse right across the street from the bus station. The owner is a very nice lady who speaks English, and our room was comfortable and cheap. Activities: Stroll around the ancient town and drink tea by the river in one of the many teahouses. Go hiking up the scenic and peaceful Jinhua Mountain. Check out the Li family courtyard and farm. Relax and unwind in the bamboo forest with BBQ and beers at a guesthouse. Food/Drink: As it is a river town, there’s plenty of fresh fish available. Most restaurants have tanks on display, so you can choose your fish and tell them how you’d like it cooked. There is one music bar in the town, where you can find beers, cocktails, and karaoke. Recommended Time: Two days here is enough – one to hang out in the town and on the river, and another to go to the mountain and the courtyard before staying in the bamboo forest.